St. Patrick's Day means a giant pot o' gold for some local Irish bars. Bar owners across the country will be feeling the luck of the Irish Monday as they open their doors to hundreds of St. Patrick's Day revelers eager for a pint of green beer or a traditional Irish dinner. According to the National Retail Federation, consumers will spend an estimated $3.6 billion this St. Patrick's Day, with nearly a third celebrating at a bar or restaurant. For many bar owners, a good St. Patrick's Day can collect a week's worth of sales in a 24-hour period. "St. Patrick's Day in our business is like the World Cup--the Super Bowl. 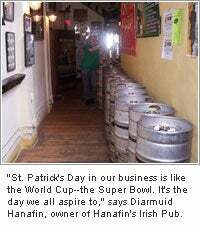 It's the day we all aspire to," says Diarmuid Hanafin, owner of Hanafin's Irish Pub in New London, Connecticut. "You're talking a sales increase that could be 300 to 400 percent. It's a huge day--if you run it properly." Here's what it takes to cash in on the St. Patrick's Day gold. When it comes to promoting St. Patrick's Day, most Irish bar owners agree that little needs to be done. "It promotes itself, really," says Brandi Simpson, general manager of O'Malleys on Fourth in Tucson, Arizona. "All you have to do is have a [bar] name that's Irish and know how to throw a good party." Since opening the bar in 1993, owners Brian and Scott Cummings have learned that the St. Patrick's Day crowd quadruples the sales of a normal busy night, with next to no advertising fueling the draw. Hanafin agrees that little marketing is necessary, but that doesn't keep him from coming up with new ideas each year to ensure a crowd. This year he helped coordinate the first New London Irish Parade to celebrate St. Patrick's Day. The parade will conclude in front of his pub. "We're expecting 500 to 600 people to walk through our doors that day because of the parade," Hanafin adds. Shaun Clancy, owner of Foley's NY Pub & Restaurant in New York, goes the more traditional route by starting the celebration early, a tactic bar owners use to remind patrons of the St. Patrick's Day revelry to come. This year, Foley's held a pre-party called Foleyoke--Irish karaoke night-- where customers won a free Guinness beer for singing a traditional Irish song. A major boost in business for bars comes from offering traditional Irish food and drink specials. Items like corned beef and cabbage dinners, Irish breakfasts and Irish stews, are just some of the customary fare customers look to purchase on St. Patrick's Day. Adding these items to his menu allows Clancy to nearly double his business's food sales. The traditional dinners are so popular, he projects he'll sell nearly 200 pounds of corned beef in one business day. In addition to Irish food and drink specials, O'Malleys honors Ireland by hiring a bagpipe band to snake its way through the crowd and play traditional Irish folk songs. The yearly tradition is just one of the many customs O'Malleys patrons look forward to every St. Patrick's Day. Such a major increase in customers is great for business--if it's managed correctly. To accommodate the crowd, O'Malleys adjoins the parking lot with a 40-foot by-100-foot tent outside to hold four extra bars and a stage for live music. Security on St. Patrick's Day goes from a team of eight to 22, with additional 24-hour security patrolling the perimeter of the tent. Hanafin's Pub also increases it's bar space by shutting down the street in front of the bar and erecting two tents to house a music stage and beer bar. To ensure the crowd doesn't get too unruly, Hanafin pays the local police department overtime to patrol the crowd throughout the day. "We have a good relationship with the New London police department, which is important. The city will let you do [a St. Patrick's Day party] every year, if it's done right," Hanafin says. Any bar owner will tell you that regulars are vital to a successful bar or restaurant. With a day such as St. Patrick's Day, where the amount of customers can double or even triple, it's important to treat your regulars with the same good service, food and beverages they're used to. One of Clancy's pet peeves is when bars increase prices on St. Patrick's Day to capitalize on the crowds. "Why hit your regular customers like that? I don't believe in charging $4 for a bottle of beer one day, then cranking it up to $7 the next day," Clancy says. He makes it a point to keep prices the same as always. "The best way to capitalize on St. Patrick's Day is to make sure your regular customers have a good time and say, 'I'm glad I went to Foley's instead of someplace else.'"